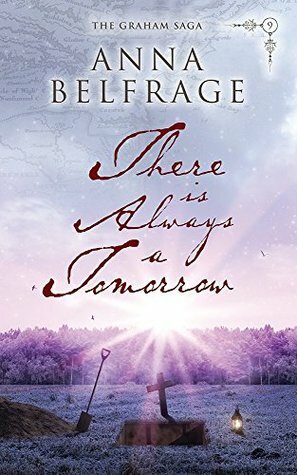 There is Always a Tomorrow is the ninth book in Anna Belfrage’s time slip series featuring time traveller, Alexandra Lind and her seventeenth century husband, Matthew Graham. I have to admit that I haven't read any of the previous eight books in The Graham Series, a fact that I hope to remedy very soon, as by reading this ninth book out of sequence, I realise just how much I have missed by not picking up the series when it first started back in 2012. The first novel, A Rip in the Veil, sees Alexandra Lind, a twentieth century woman, being whisked back in time to 1658. And so, putting that admission to one side, I can now concentrate more fully on the merits of There is Always A Tomorrow, which despite my need to keep referring back to the family tree to remind myself who was who, I found this to be a fascinating story about a family who are firmly immersed in their life at Graham's Garden in Maryland, where they are very much part of the fabric of the close knit community they call home. The relationship between Alex and Matthew is filled with love and passion and the way they act around each other after many years of marriage is testament to the strength of their relationship, which seems to be tested frequently by the behaviour of their numerous offspring.This novel seems to follow more closely the lives of just a few of their grown up children, although all the others are very much in evidence throughout the story. I was especially interested in the story of Samuel who, as White Bear, faces a dilemma about staying at home at Graham's Garden or of travelling with the indigenous people who have since become his adopted family. Also the arrival of a granddaughter, from London, causes great upset to the Grahams and threatens the equilibrium of the homestead, with catastrophic effect. What becomes apparent when reading about the Grahams is the love and fine attention to detail which the author instills in all of her characters. Like a mother she understands them and allows the subtle differences in their personalities to really shine, so that they all appear totally authentic and completely of their time in history. I think that the story works well as a standalone read, but, as a new reader to the series, I did find that I didn't always understand certain references to past events. However, the author does allow for new readers to the series and gives sufficient background information. The problem of not knowing enough about what had gone before is my fault and is no reflection on the standard of writing, which, as always, is excellent. What a beautiful review! Thank you!